cordial ties in multiple fields besides having unanimity of views on regional issues. Addressing a joint press stakeout along with visiting Norwegian Foreign Minister Borge Brendre after their meeting here at Foreign Office, the Adviser said the bilateral ties have been reinforced by around 50,000 Pakistani diaspora in Norway, contributing to different fields including parliament, education, medicine and business. He said 10 Norwegian companies had invested in Pakistan with Telenor being the biggest one, hoping that Commerce Minister Khurram Dastgir would visit Norway in October to discuss the ways to strengthen economic ties between Pakistan and Norway. He said both the sides also deliberated on regional issues including Afghanistan and Kashmir and were unanimous to believe the importance of dialogue to resolve the issues. development including medicine, economy, judiciary and business besides politics. including hydro power, adding that the two sides would also have follow up meetings on economic cooperation as Pakistan’s commerce minister was scheduled to visit Norway in October to attend a summit. growing with reducing fiscal deficit. Briefing media about his meeting with Prime Minister Nawaz Sharif, he said besides other issues, the prime minister also expressed his commitment for betterment of education sector. 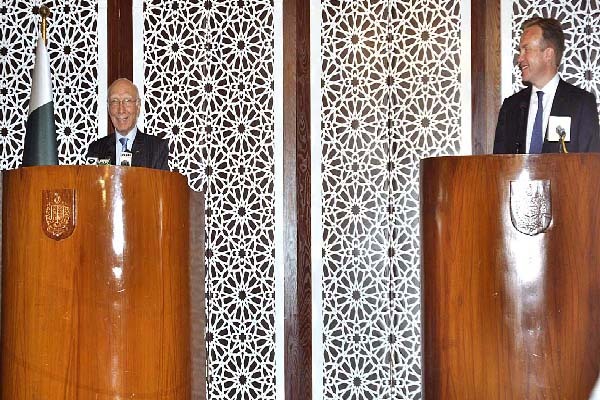 On Kashmir issue, the Norwegian foreign minister said they were trying to do their best to mitigate the situation as Norway had been positively contributing for peace in Afghanistan, Columbia and Philippine. He hoped that Pakistan and India should enhance their bilateral trade but impasse has to be broken. To a question about human rights violations in Occupied Kashmir, he said all nations had an obligation to observe human rights values. Occupied Kashmir, he said such a comment would be ounterproductive. He also complimented Pakistan’s positive role to combat insurgents by launching an offensive.